A discussion with Jason Vieaux. Bring your questions for an open discussion with this virtuoso guitarist. 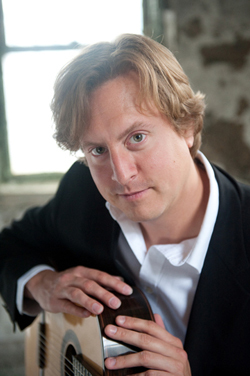 Cited as one of the “youngest stars of the guitar world” by The New York Times, Jason Vieaux is the classical guitarist that goes beyond the classical. He has earned a reputation for putting his expressive gifts and virtuosity at the service of a remarkably wide range of music, and his schedule of recital, concerto, chamber music, teaching, and recording commitments is distinguished with return engagements throughout the U.S. and abroad. Highlights for 2012-2013 include concertos with the symphonies of Toronto, Spokane, Augusta (GA) and Silicon Valley, a performance of the Lukas Foss Concerto for the New Hampshire Music Festival, duo recitals with acclaimed harpist Yolanda Kondonassis and accordion/bandoneon virtuoso Julien Labro, solo recitals in Austin and California’s La Guitarra Festival, and another Curtis On Tour sojourn, this time to South America. In May 2012, the Jason Vieaux Guitar Academy was launched in partnership with ArtistWorks Inc., an unprecedented technological interface that provides a one-on-one online study exchange between Vieaux and guitar students around the world. Jason Vieaux continues to bring important repertoire alive in the recording studio. A new Azica Records CD of solo guitar encores is planned for a 2013 release. Among his eleven commercial CDs is an Azica disc of Astor Piazzolla’s music with Julien Labro and A Far Cry Chamber Orchestra. Bach; Works for Lute, Vol. 1 hit number thirteen on Billboard’s Classical Chart after its first week and received rave reviews by Gramophone, The Absolute Sound, and Soundboard. Images of Metheny features music by American jazz legend Pat Metheny, who, after hearing this landmark recording, declared: “I am flattered to be included in Jason’s musical world.” Sevilla: The Music of Isaac Albeniz made several top ten lists the year of its release. Vieaux’s CDs and live performances are regularly on the radio and internet, and his work is the subject of feature articles in print and internet media outlets around the world every year, including magazines such as Acoustic Guitar, MUSO and Gramophone. He is a regular contributor to NPR’s Deceptive Cadence, a blog series on classical music. Jason Vieaux has performed as concerto soloist with over 50 orchestras, including Cleveland, San Diego, Ft. Worth, Santa Fe, Charlotte, Buffalo, Grand Rapids, Kitchener-Waterloo, Richmond, IRIS Chamber, Chautauqua Festival, and Chamber Orchestra of Philadelphia. Some of the conductors he has worked with recently include David Robertson, Michael Stern, Jahja Ling, Miguel Harth-Bedoya, Stefan Sanderling, David Lockington, Steven Smith, and Edwin Outwater. His solo recitals have been featured at every major guitar series in North America, as well as many of the important guitar festivals in Asia, Australia, Europe, and Mexico. Vieaux’s appearances for Chamber Music Society of Lincoln Center, Music@Menlo, Strings Music Festival, Grand Teton Festival, and the Jupiter Symphony Chamber Players have forged his reputation as a first-rate chamber musician and programmer. And his passion for new music has fostered premieres of works by Dan Visconti, David Ludwig, Jerod Tate, Eric Sessler, José Luis Merlin and Gary Schocker. In 2011, Jason Vieaux co-founded the Guitar Department at The Curtis Institute of Music with guitarist David Starobin, while continuing to head of the Guitar Department of the Cleveland Institute of Music. He is a member of the Advisory Board of the Guitar Foundation of America (GFA), and is affiliated with Philadelphia’s Astral Artists, for which he gives outreach concerts. Mr. Vieaux’s primary teachers were Jeremy Sparks and John Holmquist. In 1992 he was awarded the prestigious GFA International Guitar Competition 1st Prize, the event’s youngest winner ever. He is also honored with a Naumburg Foundation top prize, a Cleveland Institute of Music Alumni Achievement Award, and a Salon di Virtuosi Career Grant.